You will be remembered in our hearts Madame Dolly. Thank you for inspiring each and everyone of us through Education with the first university in Bicol Region - University of Nueva Caceres.. indeed, just like your father Dr. Jaime Hernandez Sr. you are an ICON of the BICOLANDIA. Share your stories or personal experiences with Madame Dolly. Email us at nagacitydeck@yahoo.com or ncdadmin@nagacitydeck.com OR leave your comments below. 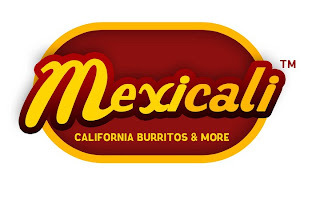 Your stories and messages will be collated and posted on this site. M.A. in Administration of Higher Education, Columbia University in New York City. Philippine delegate to the World Tourism Organization Conferences in India in 1983; Mexico, 1982; Italy,1981; Manila, 1980; and Spain, 1979. Recipient: Gold Humanitarian Service Cross, the highest Red Cross award for volunteer service excellence (1992). Recipient: Aurora Aragon Quezon Medal for distinguished leadership in the cause of humanity. Recipient: People's Republic of China Red Cross Medal for being the first Filipino to visits the Red Cross Headquarters in Beijng in 1996. Recipient: Presidential Citation of Recognition and Commendation. Adviser: Mother Butlers' Mission Guild (Camarines Sur). Route: Basilica Minore to Bombon's People Center - passing through Balatas Road, Matiway, San Felipe, Pacol, Carolina left to Brgy. Siembre. to this deadly disease—making it every individual’s responsibility to support the fight against breast cancer. Avon KGBC’s mission to help provide access to care and support to medically under-served women. Participation in the annual event translates into a Kiss donation for all breast cancer victims. Your Kiss via a Kiss Card, which will be included in the KGBC shirt for the walk participants and race kit for the run participants, will be numbered and counted to fulfill the 125,000 target. race number and giveaway. To join the walk, purchase of the KGBC shirt at P220.00 serves as your registration already. The KGBC shirt will be available from your Avon Representative beginning September 1, 2011. Proceeds from the event, which will be held at the SM Mall of Asia Open Grounds, will go to PGH Breast Care Center and selected provincial hospitals. Run Registration begins July 16, 2011 (except R.O.X) via Avon KGBC’s official website www.avonkgbcphilippines.com. R.O.X. Bonifacio High Street (856-4639) starting September 4-26, 2011 only. Jewelry Workshop in Naga to teach jewelry as gifts for Christmas. Slated on Nov 5 to 6, 2011 by Baycrafts Jewelry. Enroll now to get your slots. 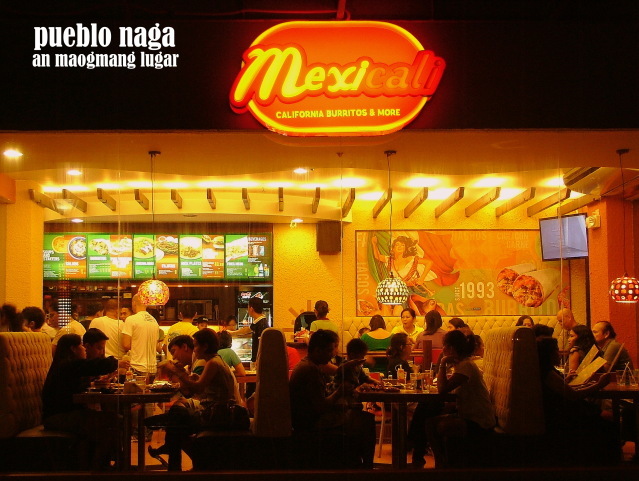 A hot and added flavor is in our city which will surely satisfy our native tongue for spicy foods. 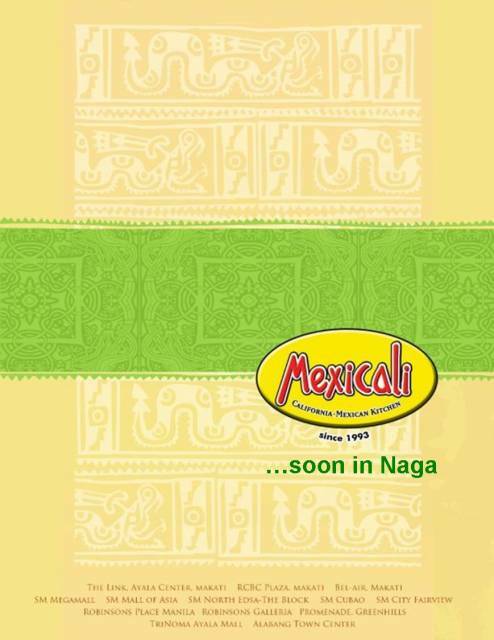 Mexicali Naga is Mexicali Philippines' FIRST franchise outside Metro Manila which means another FIRST in the Bicol Region! Where can we find Mexicali in Naga City? Only at the entertainment hub of Naga City =D. 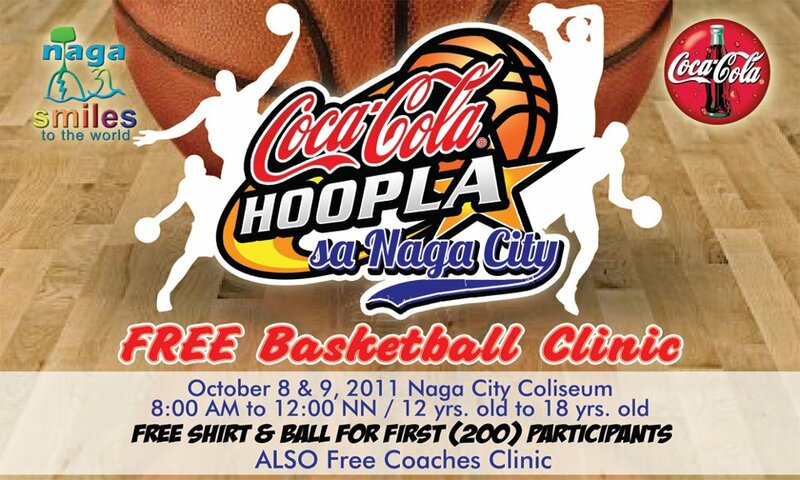 Another LIVE PBA Game in Naga City on November 26, 2011 only at the Big Dome of the South, Naga City Coliseum!